AOMedia Video 1 (AV1) is an up- and coming open video codec that is backed by a large number of tech companies including Mozilla, Google, Apple, Microsoft, Facebook, Netflix, or Nvidia. AV1 is royalty-free, a fact that makes it very attractive to companies that produce hardware and software that support video streaming. Individual programs or the underlying operating system need to support the AV1 codec for playback. Mozilla and Google support AV1 already in Firefox and Chrome, and support for the codec was added in other programs such as VLC Media Player 3.0, FFmpeg, or MPC-HC. YouTube enabled experimental AV1 support on the video streaming site as well recently. Microsoft released a beta version of the AV1 Video Extension codec for Windows 10 recently. The codec is available on the Microsoft Store and there only for devices running Windows 10 version 1809 or later. Microsoft stopped the rollout of the new feature update for Windows 10 in early October 2018 after reports of serious bugs emerged on the Internet. Microsoft confirmed the bugs and has been working on an updated version ever since. The Av1 Video Extension application for Windows 10 requires that the October 2018 Update for Windows 10 is installed on a device; this limits the reach of the extension significantly at this point in time. 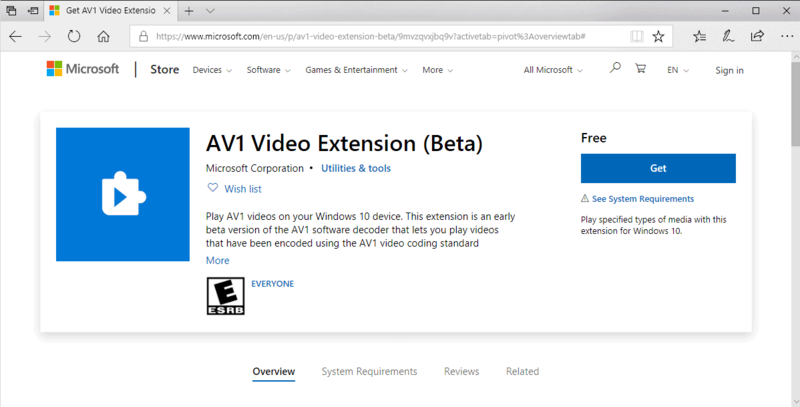 Interested users and administrators may install the Av1 video codec from Microsoft's Store to add support for it to the system. Microsoft published Web Media Extensions and the HEVC Video Extension applications to the Microsoft Store previously to add support for OGG, Vorbis, Theora and HEVC to the Windows 10 operating system. Installation of AV1 Video Codec on supported devices adds playback support for AV1 video files to the device. The codec is installed system-wide; any application may use it to support playback of AV1 video files. Users may play AV1 videos in Microsoft Edge or use apps such as Windows Media Player to play AV1 videos. Microsoft released the initial version as a beta to the Store. The company notes that users may experience performance issues when they play AV1 video files after installation of the video codec on the system and that it will release updates that improve the extension. Support for the codec is only available in Windows 10 version 1809 or later; customers who run earlier versions of Windows need to find other solutions to add support to their systems. Popular video players such as VLC support AV1 already and all major browsers support it or will support it as well. Now You: What is your take on AV1? Microsoft released a beta version of the AV1 Video Extension codec for Windows 10 version 1809 that adds AV1 video playback support. so ridiculous you have to go to the store to get a freaking codec. I was thinking just the same before I read your comment. Via UWP store? No i wont. It’s good that Microsoft supports it now officially. If you don’t want to use the store for AV1 playback you don’t have to. LAVFilters support it, so your directshow player will support it with LAVFilters installed. I think the “store” will enable it on Edge. If you don’t use Edge, LAVFilters are more than enough for local playback. Your browser Firefox/Chrome/Vivaldi/Opera etc already support it. I still don’t get why they say it can be used system wide when it doesn’t work in the movie app, or windows media player. Looks like it handle the 8-bit files, but not the 10-bit samples. VLC won’t open any of them unless you use a daily build. Hey @Martin, are there any good HEIF / AVIF encoders available ? Good question, I have not looked into this and a quick search did not reveal anything promising. Anyone? Guess we’ll have to wait until Apple sells more devices and makes it a norm and MS realises HEIF’s a worthy successor for JPEG.